A sale can be made or lost as a direct result of your home’s curb appeal. When it comes to selling your home, the first impression is probably the most important impression. If the outside of the property doesn’t create interest or appear well-maintained, a buyer may choose to not even come inside the home. Here are five ways to create curb appeal. Paint and polish. A fresh coat of paint breathes new life into a tired-looking home. If your home looks dull or suffers from peeling, cracked or chipped surfaces, a paint job is a great investment. Polish the doorknocker and mail slot on the front door, as well as any light fixtures by the entry. Re-condition your deck. Consider renting a power washer to clean dirt and mildew from the wood, and then apply an all-weather sealer or stain. Manicure the grounds. Mow and edge the grass, and trim the trees and bushes. Also, clear away dead leaves and flowers, and mulch and weed the beds. Check to see that tree branches are not touching the home’s roof or outer walls. 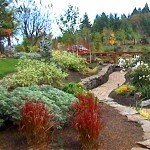 Add some color to your landscape by planting annuals and placing planters of flowers in strategic spots. You can even spruce up the property by hanging flowering baskets. Add flowering plants in the back yard, too. Make needed repairs. See if anything is unhinged, loose or just an eyesore. Fix everything including broken fencing, windows and screens. Replace any missing shingles from the roof. Try the doorbell. Check stairs and railings. Test doors for squeaks and rusted hinges. Don’t forget to take a critical look at the property at night. Make sure the lights work, and replace dim and burned-out bulbs. Unclutter. Tidy up the deck, patio and back yard. Rearrange the outdoor furniture to look inviting. Put away gardening tools and toys. Clean up the barbecue area. Eliminate any “evidence” of pets, and restrict them to the back yard when showing the home. Move extra vehicles from the view of passersby. Clean. Clean the windows, inside and out, wash down the walks and driveway, and hose down the siding. Clean outdoor furniture and cushions. Check for oil spots on cement surfaces, especially the garage floor. The old saying about making a good first impression couldn’t be truer than when you are selling your home. Even the smallest enhancements can make a big difference in creating love at first sight for buyers. This entry was posted on Monday, January 11th, 2010 at 9:54 am	and is filed under For Sellers. You can follow any responses to this entry through the RSS 2.0 feed. Both comments and pings are currently closed.